City bakery is holding their hot chocolate festival right now and you can go here to see what flavors they’ll be featuring in the coming days. But surprisingly, that’s not why I think you should head down there. 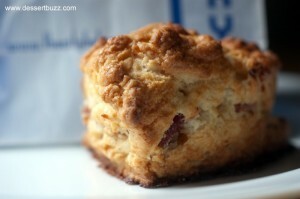 It’s not a bad reason but the best thing to get at City bakery right now is their Maple bacon biscuit. Though it has some big pieces of bacon in it, it’s not overburdened with it. The real reason why it rocks is the texture. It is very crispy on the outside and bottom and flaky like a scone on the inside. I went at 9:00 a.m. and it was perfect. Really. Definitely one of the better biscuit or scone experiences I have had in a while. Have you tried the Ritz Carlton Hotel, Central Park NY? They probably have the best scones in N.York give it a try! at face value — meanwhile, re-write the history of western learning to claim that it all depended on the Muslims. I was so incensed by the omissions, bias and outright lies that I immediately posted, both on the programme website and in a complaint email to Channel 4. Given that so many people regard TV as a source of knowledge these days, I couldn't quite believe how blindly iroirpsnseble a broadcaster could be in allowing this dangerous drivel to be aired. Just thought you'd like to know in case you have a chance to see the latest ideological assault on western history disguised as popular history.